According to Nader Khalili (Cal-Earth Institute) and Phil Vittore approximately one third of the people of the world live in houses built with earth, and tens of thousands of towns and villages have been raised practically from the ground they are standing on. Today, world consciousness about the use of natural resources and the new perception of building codes as the steward not only of individuals’ safety, but of the planet’s equilibrium, are leading us into the new millennium of sustainable living. Nader Khallil has demonstrated the structural integrity of earthbag dome. Under static testing conditions simulating seismic, wind, and snow loads, the tests exceeded the 1991 Uniform Building Code by 200 percent. These tests were done at Cal-Earth, California Institute of Earth, Art, and Architecture, under the supervision of the ICBO (International Conference of Building Officials), and monitored in conjunction with an intendment engineer. 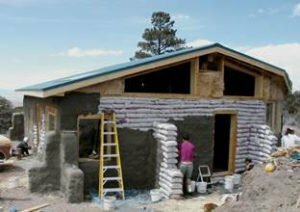 Also, earthbag buildings have been proven to withstand the ravages of fire, floods, hurricanes, termites, and earthquakes. The earthbag system, in conjunction with the design of monolithic shapes is the key to the earthbag structural integrity. Different materials have been successfully used for earthbag construction such as sand, dirt, crushed volcanic rock (scoria); etc. However, to pass the test that is needed for seismic design categories D, E and F, bags must be packed with different mixes of fluent, particulate material. These include earthen, cementations, manufactured and recycled materials that form into a permanent block. A good mix is approximately 70% sand and 30% clay. 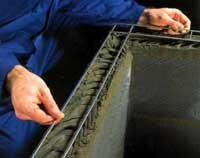 A mechanical mixer is recommended if different material such as sand and clay need to be added together to get the right mix. Use the heavy 12 ½ gauge, four-point, is better than the 15 ½ gauge. Use two strands/lines of wire between courses/raws. At corners, use an L-shaped barbed wires or joint reinforcement to overlap with the barbed wires from each wall (as shown to the left), or use continuous wires. Overlap length should be at least two feet. 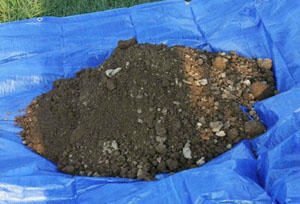 It is recommended that a testing program is developed for each project to test the quality of the soil/soil-mix used for earthbag construction. This is a particularly important if a building permit is needed in Seismic Design Category D, E, and F.
The best information we have found about bags for earthbag building is on Kelly Hart’s website under “Frequently Asked Questions” at www.earthbagbuilding.com/faqs Some of this information is listed below.